Eye: Shimmering, amber tinted gold. Nose: Delicate, elegant and floral nose. Palate: Rich dried fruits, sultanas, tinned tropical fruit, grape, sweet wine, vanilla, pot-pourri and dark oak. The name ‘Chateau de Montifaud’ dates back six generations, and for good reason. 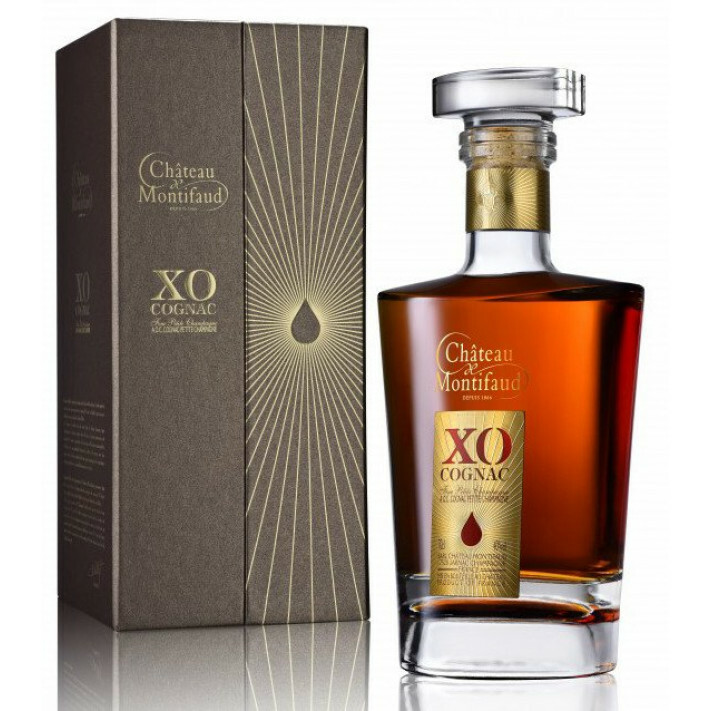 The Chateau de Montifaud Majestic XO is everything that its name denotes, and gives an insight into the oldest eaux-de-vie in the Paradise cellar of their Jarnac estate. The assembly is artisanal in every way, blended with precision using a selection of the finest eaux-de-vie from the Petite Champagne cru. As an Extra Old Cognac, it has been aged for at least 6 years in keeping with French legislation. However, Montifaud are renowned for maturing their spirits well beyond the required period. After a preiod of artisanal distillation, they are left to sleep in Limousin red oak barrels, and then old French oak casks in their cellars, they make the most of a dry, cool environment to create a fine Majestic XO Cognac. The Petite Champagne is highly thought of thanks to the unique limestone content of the subsoil, and chalky soil which makes for very fine eaux-de-vie indeed. The Ugni Blanc grapes of the Montifaud vineyard which has been in possession of the Valley family since 1837. The flat earth, optimal sunlight and acidity means that the Montifaud Majestic Extra Old Cognac is truly something special and delectable. This region is also primely located in a maritime climate, hence its temperate conditions. The length and finale are everything you would expect and more from a very fine Petite Champagne Cognac. Enjoy this Cognac neat or over ice. The show-stopping presentation box opens from the centre, revealing the precious ‘majestic’ nectar within. The decanter is an oversized style, which is truly eyecatching once you open the box.